At best, you have a variety of colors to choose from, no good if the thread doesn’t hold your quilt sandwich together. All that hard work wasted for the want of a few extra dollars to buy the best machine quilting thread. There’s a big choice when it comes to choosing which quilting thread to use, always go for quality over quantity. Quality cotton threads will produce less lint than lower quality ones. They are “smoother” looking than the cheaper grades of cotton thread. Because quality threads produce less lint, they are also good for your sewing machine. You’ll also find you get thread breaking frequently if you try and use cheaper threads on a sewing machine, especially when piecing and quilting. Very annoying if you have to keep threading your sewing machine! The lower the thread number, the heavier it is. So for piecing, a 50 weight cotton is good. For the quilting, a 40 is heavier and will show up your lovely design while still being fine enough to use in a sewing machine. For hand quilting cotton thread is best and also use a heavier thread as there’s much more pulling and stretching. 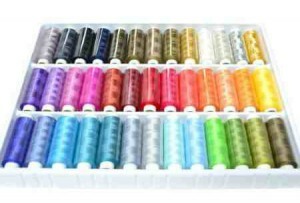 Don’t use threads specifically designed for hand quilting in your sewing machine as they’re coated with a glaze that can muck your machine up. 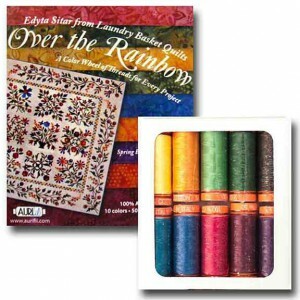 There are many different kinds of threads that can be used for quilting to create special effects. Wool threads are usually thicker than other threads, and can be used to embellish a Folk Art quilt or projects with a more homespun look. Silk threads are sometimes used for applique. Silk threads are very fine and make stitches that seem to disappear. 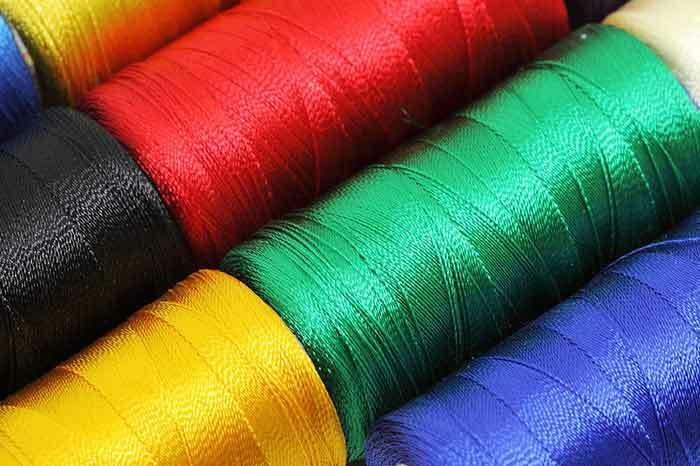 If you want to add beads to fabric then silk threads are also a good choice. 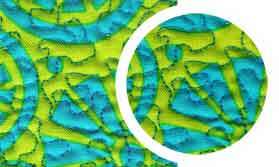 Water soluble threads dissolve when a project is washed. They are used for basting, or for any task where temporary stitches are needed. Fusible threads are used to sew a normal seam, but when the seam is pressed the fusible thread sticks the sewn fabrics together. You ca also use them for binding and appliqué. Rayon is not a natural fiber because, although it comes from cellulose it is highly processed. Colorful rayon threads are very popular with quilters, and are often used for machine embroidery and other decorative work. Nylon is not a great choice for quilting although it becomes fairly invisible when used. It can melt when ironing, becomes brittle with age and can become discolored. A fine polyester thread is a better choice. Metallic threads are usually made from a core of nylon or polyester that’s covered with a decorative product. Good quality metallic threads also have a coating to help protect the metallic layer. 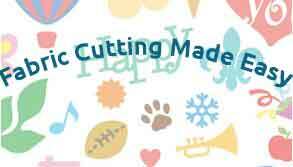 Here are a few of the manufactures of good quality quilting threads, this list is by no mean exhaustive! Aurofil Mako make good quality 50 weight threads and you ca choose from a single spool to something like “Aurifil Cotton Thread 50 Wt Over The Rainbow Small Pack”. YLI Threads – Have been in the textile industry for over 120yrs and are one of the worlds largest manufacturers and distributors of quality threads. Mettler Threads – Taken from their website, ” Mettler offers high-quality threads in many facets and colours, for a literally flourishing imagination in the implementation of ideas. Threads, colour and imagination are the three things that hobby seamstresses, quilters and creative people all over the world want – and get from Mettler. Threads in high-quality processing finish for all requirements and standards. Colours in great diversity and for every style. And imagination that is really inspired by the endless application possibilities with Mettler threads. ulky have over 4,000 items and their products are in great demand.. Joyce and Fred are education innovators. According to Fred, “educating consumers has always been a top priority and our extremely strong focus on education through the years has caused Sulky to become the most recognized and asked-for name in decorative threads”. Madeira Threads – was founded in Freiburg, Germany, in 1919, Madeira has always been committed to the production of high quality embroidery threads. In 1975, the company began to move from the domestic German market to the global marketplace. In 1987, subsidiaries were set up worldwide to streamline the distribution process. Today, Madeira maintains a presence throughout the USA, Europe, Japan and key Asian markets. Superior Threads – Bob and Heather Purcell started the company in 1998 running out of their gargage at home. Bob said “I needed to start a thread company to support Heather’s quilting addiction”. As I said, these are just a few of the manufacturers of quality threads and everyone has their personal preferences. I love Valdani, however don’t use them all the time because they are pricey (you’re paying for quality!). Experiment with threads, buy small samples and practice on scraps. Sandwich a small square, top, batting and backing and do a bit of free motion quilting. I’ll repeat, DON’T buy cheap thread for your precious projects!